Here’s another of the recipes I made for the 90th birthday party I catered last month. Saag is a South Asian dish of braised greens, usually served with bread or rice. This was requested by my client to be served as a side dish with vegetable curry. 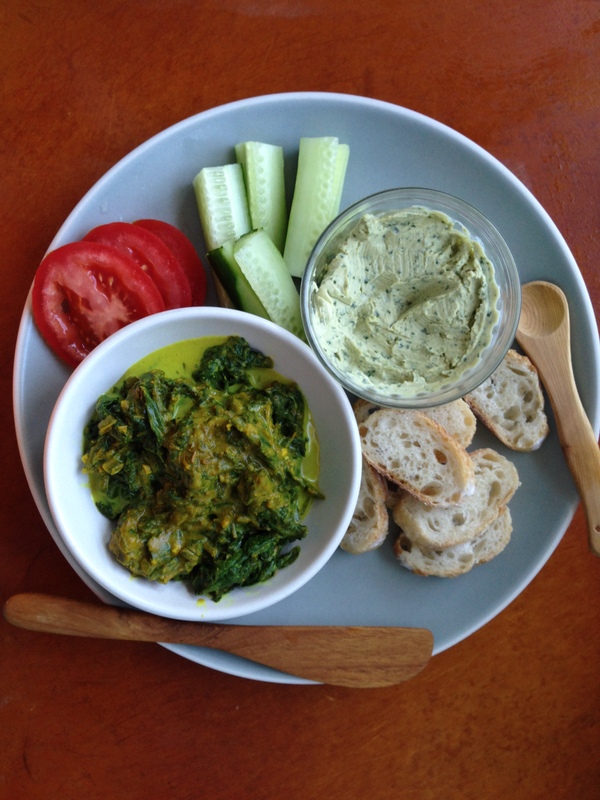 Saag can also be served as an appetizer, as shown above with fresh bread from Macrina bakery, sliced tomatoes and cucumbers, and the Lemon Tahini recipe I posted early this week. In a large frying pan or wok, melt the butter over medium-high heat, and cook and stir cumin seed, chili, garlic, and turmeric until fragrant (about 2 minutes). Stir in the chopped mustard greens and spinach a little at a time, adding the tougher parts first (the stems and thicker leaves). Continue to add greens, and cook and stir until all greens have been added and all are thoroughly wilted. Stir in the ground cumin, coriander, and salt. Cover, reduce heat, and simmer until greens are tender, about 10 minutes, adding water as needed to keep the greens moist. NOTE: Leftovers make a great breakfast. Serve reheated Saag on toast and top with poached or fried eggs. This entry was posted in Appetizers, Recipes, Vegetables. Bookmark the permalink.